﻿ Ridge Ranch Campground - Ohio. Find It Here. 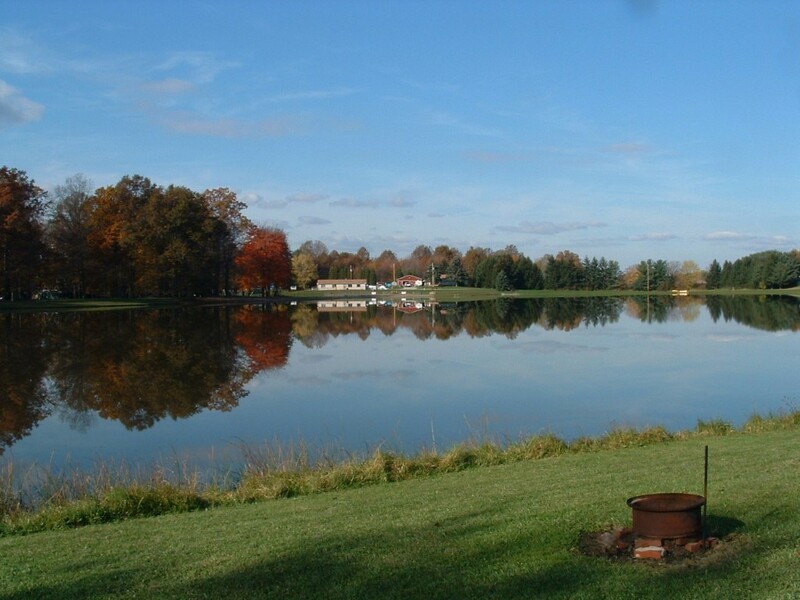 Ridge Ranch is a beautiful 77 acre family campground located right off of the Ohio turnpike and centrally located between Akron, Cleveland and Youngstown. The campground is open from May 1st to October 15th. We offer everything from big rig 50 amp full hookup pull-through sites to primitive tent camping. You can stay for a night, a weekend, a week, a month or for the full season. There is a 17 acre lake where you can fish. (you do not need a fishing license) There is a deep water swimming area with a floating platform in the middle and there is also a shallow water entry swim area. There are boat rentals such as, paddle boats, john boats and kayaks available. There are 5 playgrounds, volleyball, basketball, mini golf, tether-ball, and a dog swim area. There are scheduled activities throughout the season such as a kid's fishing tournament, poker run, hog roast, and so much more. Go to our website to get the activity schedule. We also have a DJ or bands on various weekends. There is a convenience store that sells such things as bread, eggs, milk, candy, soda, ice cream, bagged ice, fishing supplies, some RV supplies, personal hygiene products, ant things that you may have forgotten to bring with you and so much more. Propane is available. We can fill your grill tanks, RV tanks and we can also fill Motor Homes. We sell firewood that is all hardwoods harvested from our own grounds.